Coincidentally, June 6 was also “National Donut Day,” which (apparently) has been held on the first Friday in June for the past 77 years. I confess to having never heard of “National Donut Day” – but then again, I prefer bagels to donuts and I’m relatively new to social media, where I learned of “National Donut Day” and often see advertising for all manner of National [whatever] Days. June 12 is “National Jerky Day” … August 5 is “National Underwear Day.” There’s even a website dedicated to tracking “national days”: NationalDayCalendar.com. I guess the D in "D-Day" stands for Donuts? Today is the anniversary of the D-Day Invasion of Normandy. It is also National Donut Day. Today the D in D-Day stands for Donuts. The D in D-Day does not stand for Donut. Let's stop trending "Happy National Donut Day" and start trending #DDay & #DDay70. C'mon, America! It appears this is a function of excessive marketing of “National Donut Day” through all of the various social media channels. National Donut Day has its own website, Twitter account and Facebook page. Plus, media outlets and brand owners know what triggers page views and they used “donuts” as click-bait to manipulate our impulses, even at the expense of a legacy we should feel gratitude towards. 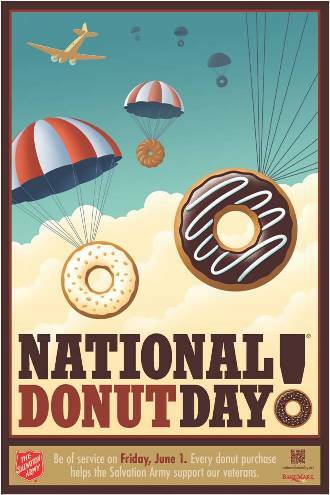 As I am wont to do, I looked up “National Donut Day” on the U.S. Patent & Trademark Office (USPTO) register, and sure enough, it’s a registered trademark. But, contrary to what you might expect, the trademark is not owned by The Salvation Army (who own 70 active trademark registrations). NATIONAL DONUT DAY® is owned by an entity named BakeMark USA LLC, a supplier of bakery products and ingredients and the U.S. subsidiary of a multinational Dutch corporation. Here’s the USPTO record (they also own a second registration for a stylized version). Why doesn’t The Salvation Army own the mark? I’m not sure. One answer is BakeMark is not relying on The Salvation Army’s prior use and goodwill … well, at least not with respect to its own trademark registration at the USPTO. The BakeMark “National Donut Day” registration claims May 2009 as the date of first use — which coincides with the rise in popularity of social media and BakeMark’s distribution agreement with Krispy Kreme Doughnut Corp. — 71 years after The Salvation Army founded National Donut Day. Lets not sugarcoat or glaze over what appears to have happened here … this new NATIONAL DONUT DAY® seems to be less about fundraising and more about promoting bakery supplies and ingredients. And it’s an arrangement The Salvation Army has blessed since BakeMark clearly associates its NATIONAL DONUT DAY® with The Salvation Army’s prior use, history and goodwill, and has been doing so for the past 6 years. The word “goodwill,” in this context, doesn’t necessarily refer to the charitable purpose behind The Salvation Army, whose noble mission is “to feed, to clothe, to comfort, to care.” Goodwill, in the trademark sense, refers to an intangible asset that adds value to a brand … it’s the history, reputation, consumer loyalty and associations created by a trademark that exists beyond the mark itself and any tangible business assets. Here’s a link to a quote from Siegrun Kane describing trademarks “as symbols of goodwill. The value of this goodwill increases with length of use, advertising, and sales. Trademarks used for a long time on successful, highly advertised products have developed tremendous goodwill.” Transferring a trademark in the U.S. without the underlying goodwill is an “assignment in gross” (or invalid transfer). It is goodwill, like click-bait, that influences consumer impulses. The Salvation Army is in the business of charity and they own a ton of goodwill. All kinds. 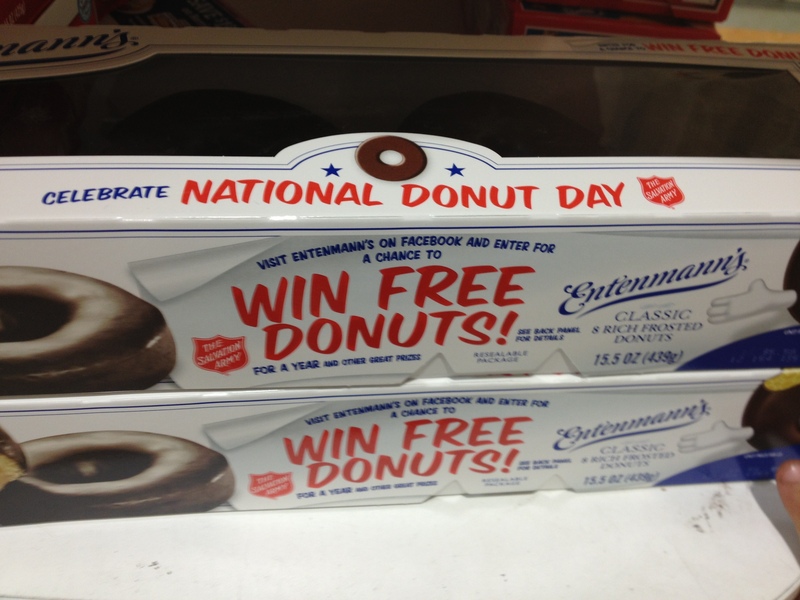 BakeMark’s “National Donut Day” would have little, if any, value without The Salvation Army’s involvement. So perhaps this “arrangement,” whatever it actually is, just makes sense. And, ultimately, it’s supposed to be for a worthy cause. But it still leaves a bad taste in my mouth. Maybe I just don’t like donuts. A “National [whatever] Day” in our calendar year can be a registered trademark. This seemingly growing trend is often about selling something rather than celebrating something. And, for the most part, it’s just harmless silly marketing … unless it involves war and charity. Claiming exclusive rights to a day meant to create awareness and appreciation can have harsh consequences. What if your local donut shop or bakery doesn’t use products by BakeMark or isn’t authorized by BakeMark, does that mean it is not supposed to be NATIONAL DONUT DAY® at your store? So much for the greater good. The allied troops who stormed the beaches of Normandy and the vets who have survived to live on the 70th anniversary of that date deserved better than to have their historic day dunked by donuts. They have more goodwill than BakeMark’s NATIONAL DONUT DAY® will ever have.